Baruch Tzvi/Hersch Rutner was the older brother of my great grandmother Esther Rutner Joshowitz. 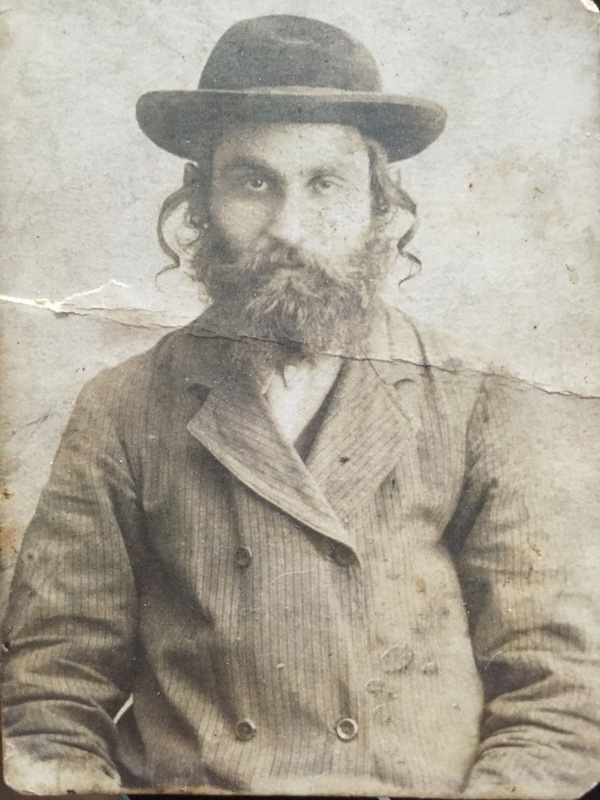 He was a Rabbi and shochet (Jewish ritual slaughterer) and was well-respected in the area and lived in the same general area until the time of the Holocaust. I recently found a (labeled!) photo of him. There was a cousin named Efrayim Fuchs, who lived in Bnei Brak, Israel, with whom my great uncle Izzy kept in touch. I'd spoken to Mr. Fuchs about the family in the 1990s, and he told me that his father's name was Baruch Hirsch Rutner and his mother was Kreindel Fuchs--but since his parents weren't legally married (as was common in the area), he went by his mother's maiden name. I have both Rutners and Fuchses in my family. So how was Efrayim Fuchs related to me? I have a new batch of vital records that have helped me to figure it out. There was a family in the records that looked very similar to the siblings that Efrayim had described--but with a different surname for the mother. Earlier, I wrote about Samuel Soupcoff, a world-renowned mining engineer. I looked in multiple sources to try to find where this branch of the family lived, only to find either "Russia" or him lying and saying he was born in Pittsburgh. 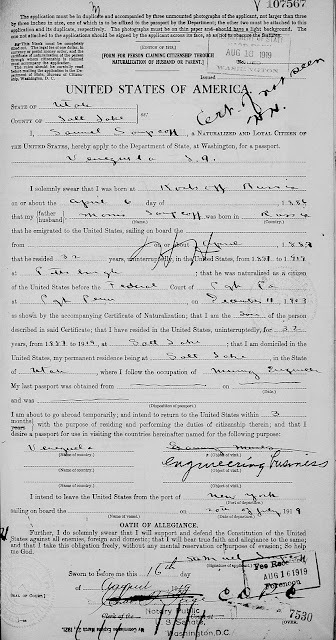 Recently, FamilySearch added some new passport applications. 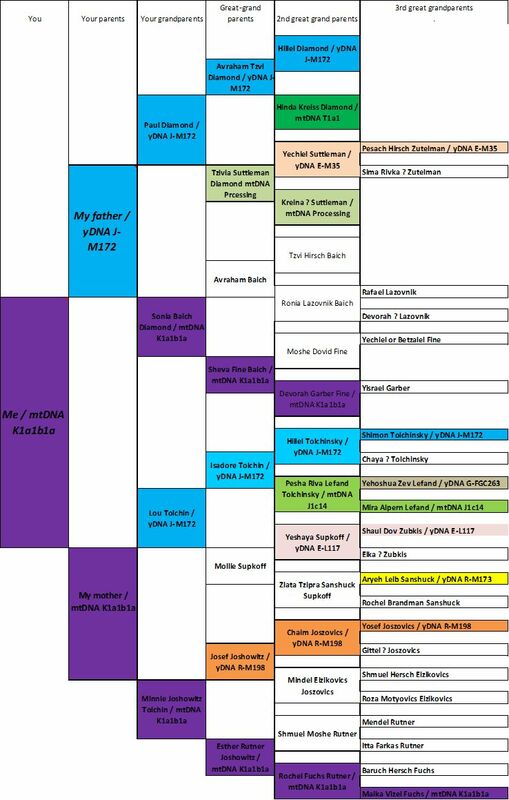 So I searched the collection for different families I'm researching and found some very interesting information. My great-great grandparents were Shmuel Moshe and Rochel (nee Fuchs) Rutner. I didn't know when he died; when my grandmother Minnie's older brother (my Uncle Izzy) came to America in 1920, both Shmuel Moshe and Rochel were still alive. Izzy's and Minnie's younger sister Ruth's Hebrew name was Rochel; Ruth was born in 1927, so Rochel likely died between 1920 and 1927. But no one in my part of the family was named for Shmuel Moshe until the 1960s, by which time he would have been well over 100 years old. My great-great-great-great grandparents were Yitzchok and Shayna Basya Halperin, parents of my great-great-great grandmother Mira Halperin Lefand Marienhoff. They were originally from what is now Krasnae, Belarus; they both passed away when living in what's now Nezhin, Ukraine. And their death records show two extremely long lives, especially for that era. 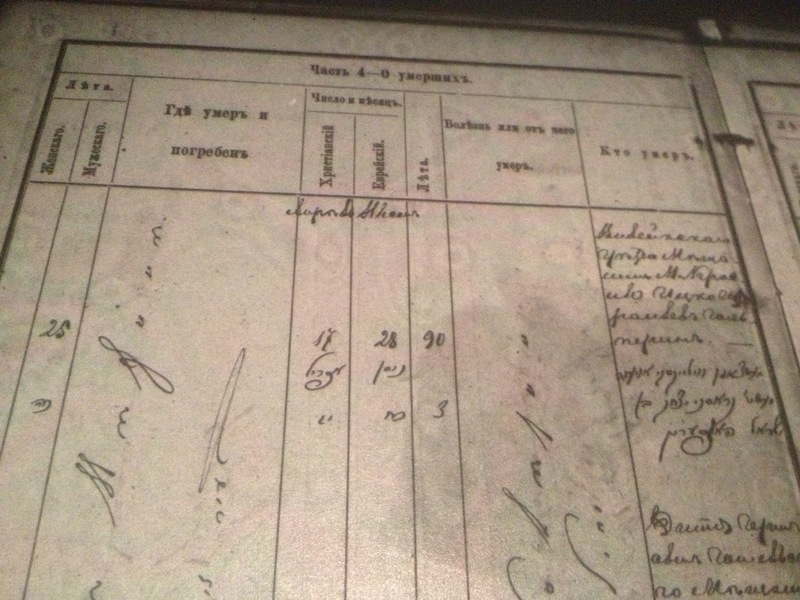 Pava Rutner Berkovics was my great-great-great aunt. She was a sister of my great-great grandfather Shmuel Moshe Rutner and a daughter of Mendel and Itta (nee Farkas) Rutner. While most of Mendel and Itta's children lived very long lives, Pava's was rather short. She was married to Aron Berkovics, and they lived in Also-Neresznicze (today's Neresnytsya, Subcarpathian Ukraine). At the age of 19, she gave birth to her son Abraham-Volf. I've always thought that the migration patterns for Eastern European Jews was that the father &/or older children would come to America and earn money to bring over the mother and younger children. I've seen that pattern in several branches of my family. But that wasn't always the case. When I was at RootsTech this past month, I spent the entire Monday before the conference at the Family History Library going through roll after roll of microfilm. Near closing time, they started making announcements that there were 30--and then 15--minutes remaining, so I just started taking photographs of images without looking at anything. This week I looked through them--and this "strategy" got me information I probably wouldn't have gotten otherwise. Last week, I wrote about how I discovered that my great-great-great-great grandparents were Eizik and Eidel Vizel from Nagy-Kirva. I did not know that when I was in Salt Lake City. 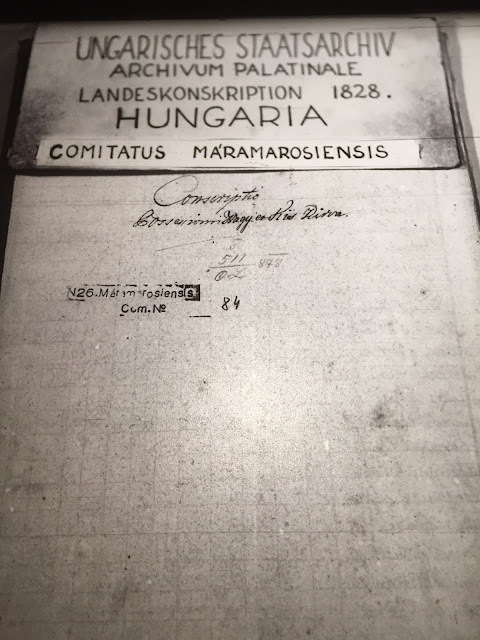 But it seems that in my mad rush to photograph as much as possible, I photographed the 1828 Hungarian property tax census for Nagy Kirva! Earlier, I posted about the Red Cross tracing forms that my grandmother (Sonia Diamond) had filled out in the 1950s. 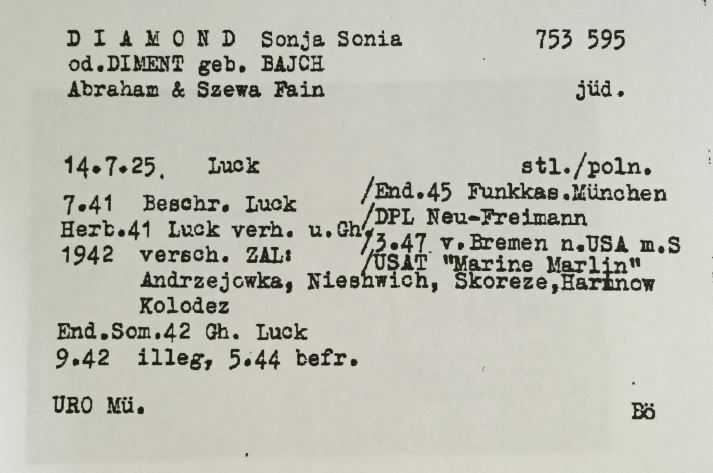 The International Tracing Service (ITS) also had a series of documents tracking my grandmother through Displaced Persons (DP) camps after WWII.